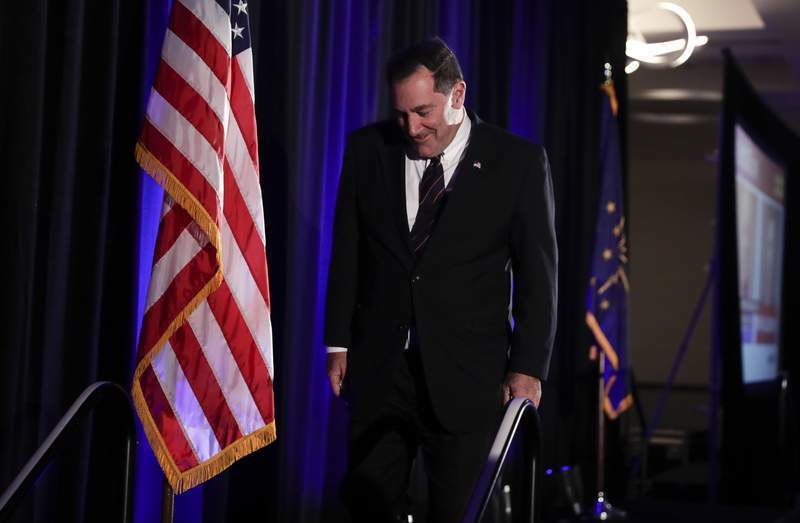 Sen. Joe Donnelly, D-Ind., leaves the stage in Indianapolis on Tuesday night. 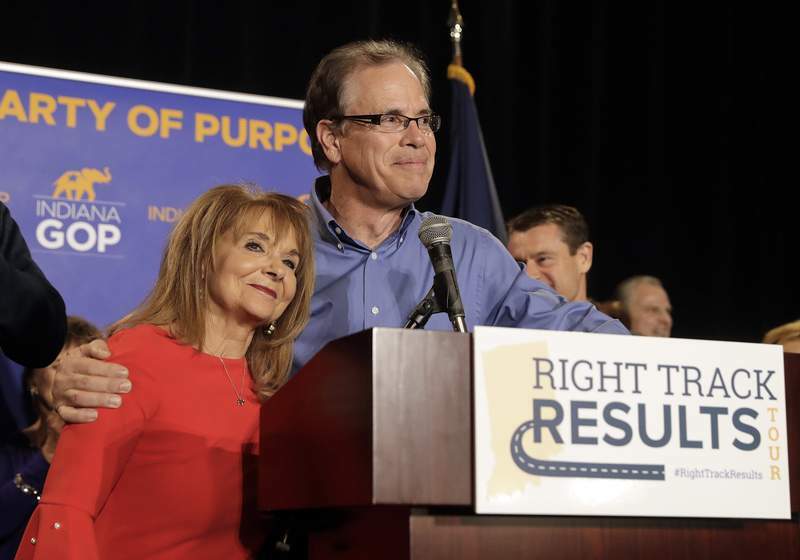 Republican challenger Mike Braun defeated first-term Sen. Joe Donnelly, D-Ind., on Tuesday, ending a bitter, expensive battle over which candidate was outsourcing jobs to another country and which one was a threat to people's health care. Braun attracted 53 percent of the vote to 43 percent for Donnelly and 4 percent for Libertarian Lucy Brenton. Granger resident Donnelly, 63, becomes the second incumbent to give up the seat since 2012, when six-term incumbent Lugar lost the Republican primary election to Richard Mourdock, who lost to Donnelly in that year's general election. Donnelly is the third member of Congress whom Braun, a wealthy businessman from Jasper, has defeated this year. Braun, 64, beat U.S. Reps. Todd Rokita and Luke Messer in the Republican primary election in May. Donnelly and Braun had pounded on narrow themes throughout their race. In campaign appearances and round-the-clock TV ads, Donnelly hammered at Braun and his companies for distributing Chinese auto parts, while Braun labeled Donnelly “Mexico Joe” for having invested in a family business that outsourced work to America's southern neighbor. Braun offered his company's health insurance plan as a model for cost containment, while Donnelly bashed him for supporting a lawsuit that would eliminate the mandate that pre-existing medical conditions be covered under the federal health care law. Hours before election results came in, Donnelly tweeted that Braun would vote to cut Social Security and Medicare benefits and end health insurance coverage for pre-existing medical conditions. “We can't trust him to have our backs,” Donnelly tweeted. The election outcome was not nearly as close as polls suggested. Most surveys showed the race as a statistical tie. But Brenton, regarded as a possible spoiler after being favored by as many as 8 percent of voters in polling, was seeing less support Tuesday than she did when she ran for Indiana's other Senate seat and collected 5.5 percent of the ballots. In Allen County, Braun received 53 percent of the vote to Donnelly's 44 percent and Brenton's 3 percent. Despite having served in the Indiana House for three years, Braun constantly depicted himself as a political outsider and successful business owner. He has reported personal assets of between $35 million and $96 million and was inspired to run by the 2016 election of President Donald Trump, who campaigned for him Monday evening in Fort Wayne and Friday in Indianapolis. Like Trump before him, Braun also called Donnelly “Sleepin' Joe” for not having a sponsored piece of legislation signed into law. Donnelly repeatedly described himself as a bipartisan moderate willing to work Trump and Republican senators – he said he voted 62 percent of the time in favor of Trump's positions – while steadfastly defending his votes to oppose Trump's tax cuts and GOP attempts to repeal the Affordable Care Act. “It's not about R and D or red or blue, it's about the red, white and blue,” Donnelly said at a debate. Outside political advocacy groups have spent nearly $68 million trying to influence the outcome of the election, the third highest total nationally behind Senate contests in Florida and Missouri, according to the nonpartisan Center for Responsive Politics. Braun had lent his campaign more than $10 million through the middle of October and at that point had raised about $17 million in all compared with more than $16 million raised by the Donnelly campaign. Donnelly was elected to the House in 2006 in the South Bend-based 2nd Congressional District. Braun was a state representative from Jasper from 2014 to 2017. Ever since Trump won Indiana by 19 percentage points in 2016, Donnelly had been considered perhaps the most vulnerable Democratic senator up for election this year. He had led Braun narrowly in recent polls, although the difference between them was usually within the margin of sampling error, making their race a statistical tie. Trump blasted Donnelly and Democrats at the Monday rally at the Coliseum.